Suffolk radio station blends community awareness with merengue and reggaeton. While the last notes of a well-known Colombian salsa song play out and a Venezuelan merengue is next on the pre-recorded mix, Ana Maria Caraballo, 29, takes a call from a Dominican woman who just won a pair of tickets for an upcoming reggaeton concert. Having been recently promoted to program director, in addition to her on-air radio personality job for WBON La Fiesta 98.5FM, Caraballo, a Puerto Rican native, is no stranger to dealing with the rich diversity of Latin culture and all the differences that exist between nationalities. “Latinos are a melting pot,” she said. Through La Fiesta, Spanish-speaking immigrants from Huntington to Montauk have been able to move to the rhythm of music from their native countries, listen to Latino-centric talk shows, and receive important information about everything from immigration policy to charity events. As a Suffolk-based radio station, La Fiesta is considered “class A” due to its limited geographical reach, a fact that John Caracciolo, the owner of the station, considers an advantage. With a more focused listenership, he can offer cheaper advertising rates than other radio stations that also cover New York City. “We’re built and continue to be built on local advertisers,” Caracciolo said. With advertisers such as Huntington Honda, TD Bank, and the Long Island Ducks baseball team, this niche methodology is especially important for La Fiesta, the only Spanish-language radio station that reaches all of Suffolk County. There’s definitely an audience: Suffolk is home to 246,000 Latinos, or 16 percent of the total population, according to a recent Suffolk County Government Comprehensive Plan report. Of those Latinos, the Fiscal Policy Institute reported in a 2010 survey that about 170,000 are Spanish-speakers. “La Fiesta was needed,” Caracciolo said. Farmingville, NY –La Fiesta 98.5 FM presents the biggest outdoor Spanish music festival on Long Island, Fieston 2012, staring Daddy Yankee. The pioneer of Reggaeton, Latin Grammy, Billboard and MTV Music award winner will make his first appearance on Long Island on September 7th and the brand new Pennysaver Amphitheater in Farmingville. Daddy Yankee, recognized as an icon of Latin music worldwide will headline Fiestone a nonstop calibration of Spanish music and culture presented by Long Island’s top Spanish radio station 98.5 FM LaFiesta. Joining Daddy Yankee will be Frank Reyes el Principe de la Bachata, Alexis y Fido- Los reyes del perreo, El Cuco Toño Rosario, and the new bachata sensation Leslie Grace. This is an event for the entire family, to celebrate the end of summer 2012 and to celebrate a full day of culture and entertainment. Gates to the Amphitheater will open at 4p and the first artist hits the stage at 5PM. Long Island Events is the new operator of the Pennysaver Amphitheater formerly known as the Brookhaven Amphitheater. Long Island Events has committed to bring low cost, high level entertainment to Long Island. The Pennysaver Amphitheater at Bald Hill, formerly The Brookhaven Amphitheater is located on Bicycle Path in Farmingville. Please visit www.pennysaveramp.com for more information on the venue and a full schedule of upcoming events. Walk into any school, High School, Junior High or elementary school anywhere on Long Island or anywhere in America and the first thing you will run into is a trophy case commemorating athletes, the theater program, scholars and even musicians. All very well deserved honors and very fitting. But what we are missing is that wall of honor that salutes the brave men and women who have graduated from these very schools, have joined the armed forces and have gone on to protect and serve our Country. We need to honor them as well. Meet Chelsea Anderson a High School Junior from Eastport South Manor Junior Senior High School in Manorville. She along with her classmates formed the Wall of Honor Committee and their goal is to build a wall outside their school library that will honor the brave men and women who have graduated from ESM Junior Senior High and have gone on to protect and serve our great land. This is a huge undertaking and the students have committed a tremendous amount of time and effort to complete this project. It is estimated that the wall will cost $60,000 to complete this is a small amount when it is compared to the contribution of these men and women to our country each and every day. On Wednesday June 20th, My Country 96.1 FM morning radio host Phathead invited Chelsea Anderson and the Principal of ESM Junior Senior High School on his morning radio show to discuss the project and introduce their plans to the My Country 96.1 FM Long Island listeners. The studio phones, the stations facebook and Twitter accounts went into overload with offers of support and encouragement. “All the listeners of My Country 96.1 asked how they could help and what they could do to get involved” said morning man Phathead. “So I figured, why not have the students on stage at our big Freedom Fest concert and give our listeners a chance to meet them and donate towards the project and we’ll even play Lee Greenwood God Bless the USA while they are on stage”, he added. So with a few phone calls and some quick thinking, My Country 96.1 is going to get them their wall! 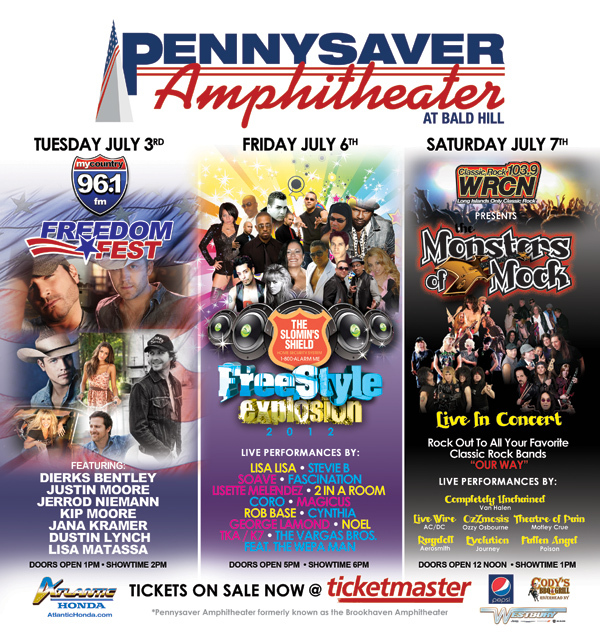 On July 3rd 2012, My Country 96.1 presents its second annual Freedom Fest Concert at the Pennysaver Amphitheater at Bald Hill. This is an all day festival and celebration of America staring Country Music superstar Dierks Bentley and eight additional acts. Phathead called his friends at Capital Records who spoke to Dierks and filled him in on the project and he immediately offered to donate one of his brand new acoustic guitars and two meet and greet passes for the July 3rd show. The guitar will be raffled off on July 3rd and the lucky winner will get to take the guitar back stage so Dierks can personally sign it for them. This is a once in a lifetime priceless prize that will give the students the ability to raise a big chunk of money for this project. 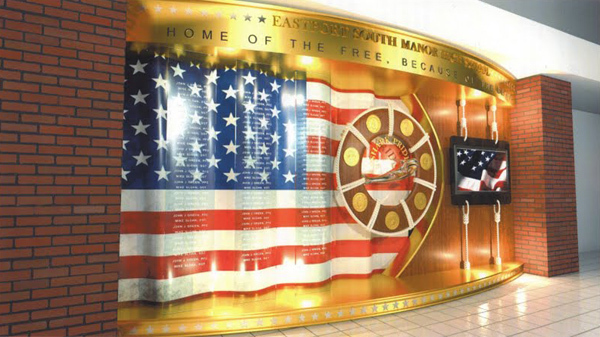 All the proceeds from this raffle and all the donations from the day will go to the ESM wall of Honor committee. Party 105.3 superstar night DJ Miss Stacy has been selected as one of the hottest women in radio for 2012 by the music industry, celebrity website, PopCrunch.com. This is the 4th annual Hottest Women of Radio awards, the contest was started by the PopCrunch staff after many requests by radio station listeners and PopCrunch supporters. The response is overwhelming, with tens of thousands of total nominations that nominated well over 200 different women of radio. PopCrunch editors whittle it down from there and compile the rankings based on available photos of the women as well as from reading the nominations. It is easy to get a sense of which DJs are the most loved and have great personalities from the nominations. PopCrunch reports that is one of the most popular pieces they do every year with the 2011 list having been viewed over a million times since its release. “Its obvious that the American people still care greatly about their local radio stations” says the PopCrunch staff. This is the second year Party 105’s Miss Stacy has made the list and with much love and listener support she has been selected as the 7th Hottest Woman of radio for 2012. “It is a honor to be recognized nationally with females I grew up listen to and admiring, thanks to the Long Island listeners my JVC family, my friends and supporters”, said Miss Stacy. “I am so proud of Stacy and all of her professional accomplishments, this one too, but it does make it difficult to run the radio station with a crowd of guys outside every night all looking to date her”, said Party 105 President and CEO John Caracciolo. Miss Stacy can be heard weeknights on Party 105.3 Long Island from 6 PM to 10 PM playing great dance music, talking to her fans, and playing tons of listener requests. PopCrunch.com is run by PopCrunch Media a publisher of celebrity lustiness. PopCrunch Media basically publishes celebrity gossip, news, and videos. 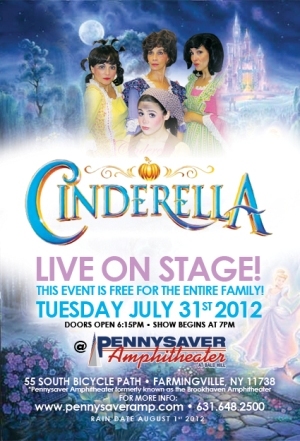 Farmingville, NY – Coming Tuesday July 31st Cinderella hits the big stage at the brand new Pennysaver Amphitheater, and on Tuesday August 14th Pinkalicious is live on the big stage. Cinderella is the most classic of all fairy tales, and it springs to life in this fast-paced musical production! Featuring a professional cast and live music, all the ingredients that have made the story a perennial favorite are here – ragged Cinderella, her cruel stepmother and selfish stepsisters, the ball, the handsome prince looking for a bride, the fairy godmother, the glass slipper, the search for the foot that fits it, and the happily-ever-after ending! This musical will delight the young and “young at heart.” Gates to the Amphitheater open at 6:15PM and show time is 7:00PM. This show is completely free to the public. Pinkalicious comes to life! 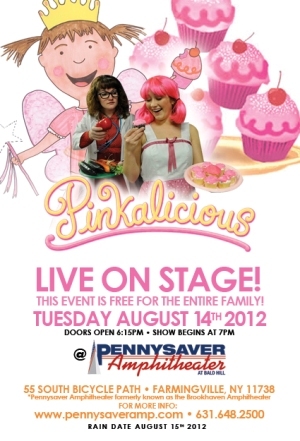 The original production of Pinkalicious, the Musical that kids just can’t get enough of makes a stop at Pennysaver Park on Tuesday August 14th. This is another Free event for the entire family. Gates open at 6:15 and show time is 7:00PM. Long Island Events is the new operator of the Pennysaver Amphitheater formerly known as the Brookhaven Amphitheater. Long Island Events has committed to maintain free family event for years to come. John Caracciolo, President of Long Island Events said, “Thanks to our partners and sponsors we are able to continue the tradition that the Town of Brookhaven started and maintain free family events for all to enjoy”. “ Our sponsors really make this happen”, he added. All free family shows start at 7:00PM sharp. Permanent seating and lawn seating is available. No food or beverages are permitted at the Amphitheater, a full concession available. The Pennysaver Amphitheater at Bald Hill, formerly The Brookhaven Amphitheater is located on Bicycle Path in Farmingville. Please visit www.pennysaveramp.com for more information on the venue and a full schedule of upcoming events. Special thanks to all the sponsors that made this event possible like All Island Media, Fidelis Care, local businessman and owner of Porters on the Lane, John Giannott, Stephens 112 Auto Group, Dan Farrell and The Suffolk County Association of Municipal Employees, Pepsi Bottling Company of Long Island, Donaldson’s VW, George’s Wireless Cable and Home Theater in Sayville, Krazy Kidz of Medford and Suffolk Center for Therapy and Speech Rehabilitation in Stonybrook.